Travis Longcore, light pollution researcher and Karen Trevino, chief of the NPS Natural Sounds and Night Skies Division, speaking at the 2015 AGM Plenary Session. The 2015 AGM conference was a great success! 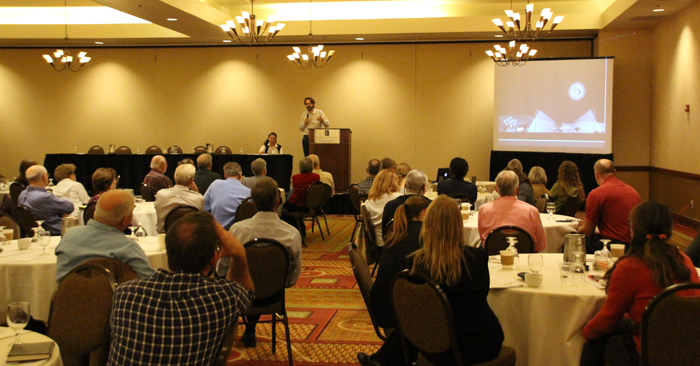 The Embassy Suites in Phoenix was filled with people from all over the world passionate about protecting our night skies. The conference theme, “One Coin ~ Two Sides: Impacts of Light Pollution to Fish and Wildlife Resources and the Mitigating Role of Emerging Lighting Technologies,” proved to be of considerable interest to conference attendees, who said they really enjoyed the variety of topics and passion of the speakers. Presenters included a diverse array of of scientists, lighting professionals and designers, astronomers, educators, university representatives, policy makers, opinion leaders, city planners, government officials, IDA chapter leaders and concerned citizens. From fireflies and wallabies to national parks and oil drilling, there were presentations to engage everyone. See the conference schedule and abstracts for more details. Presenters’ PowerPoint presentations will be available soon. Attendees expressed that they appreciated the “community feeling” of the event and the lively participation of the audience. The energy at the conference was palpable and the session speakers inspired many conversations and the exchanging of ideas on what needs to be done to continue making progress protecting the nighttime environment. We hope the enthusiasm continues! The conference also included an IDA awards presentation to honor the commitment and dedication of dark sky advocates across the globe. You can read about the amazing efforts of award winners here.